Mustard is one of the healthiest condiments out there and it happens to be Alana’s favorite. Why not add some probiotic goodness to this cancer fighting and inflammation reducing nectar of the condiment gods? Enter fermented mustard. Our Spicy Fermented mustard is going to be a hit at your next tailgate or barbecue! Warning: It definitely packs a kick! Use in small doses! If you’ve made your way over to our blog from our other blog, Great Big Globe, you may remember when we took a fermentation class in Guatemala at Love Probiotics. They sell a super awesome spicy lacto-fermented hot sauce that we slathered on top of our eggs each morning. 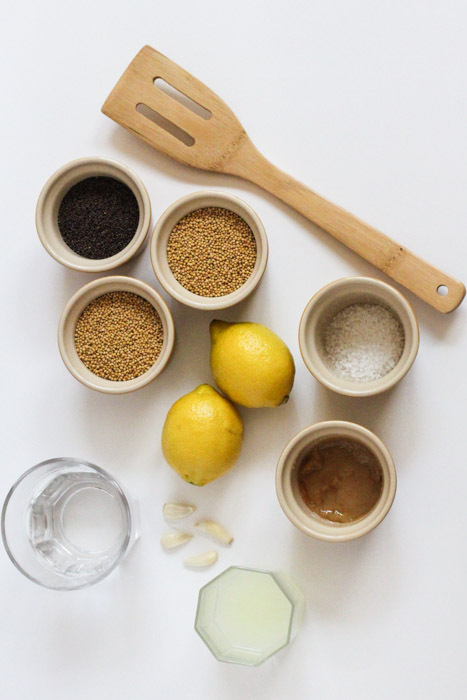 It made us think, why not ferment mustard? 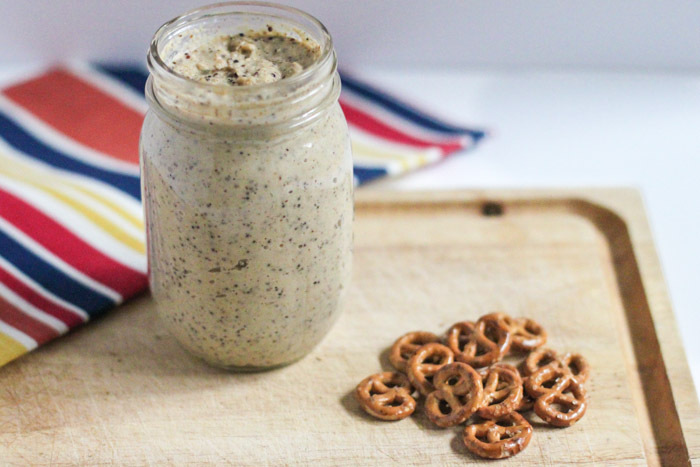 This spicy mustard packs the probiotic benefits of fermented foods, so it’s great for your digestion and the perfect compliment to burgers, brats and hot dogs! This recipe is extremely easy and comes together quickly. 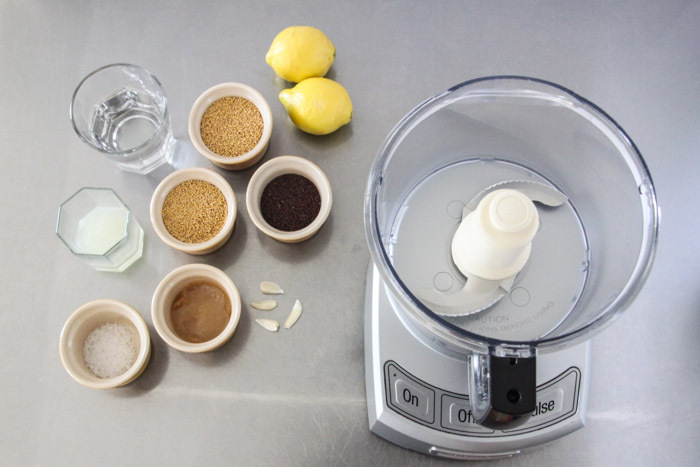 Simply add all ingredients to your food processor and process! It does take awhile for the mustard seeds to open up and blend with all of the other ingredients. We let the food processor go for about eight minutes, stopping to scrape the sides at the three and six minute marks. 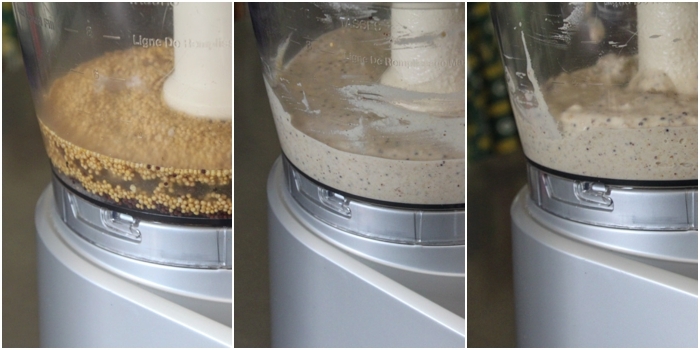 Once you are finished blending, transfer the mixture into a glass jar. At this point, I have to beg you to not try it. I know, I know, the smell is intoxicating and you want to gobble it up right this minute. Just don’t do it. We were severely disappointed with the taste at this point. So much so, we almost dumped it! But as with a lot of things, this mustard gets better with age. 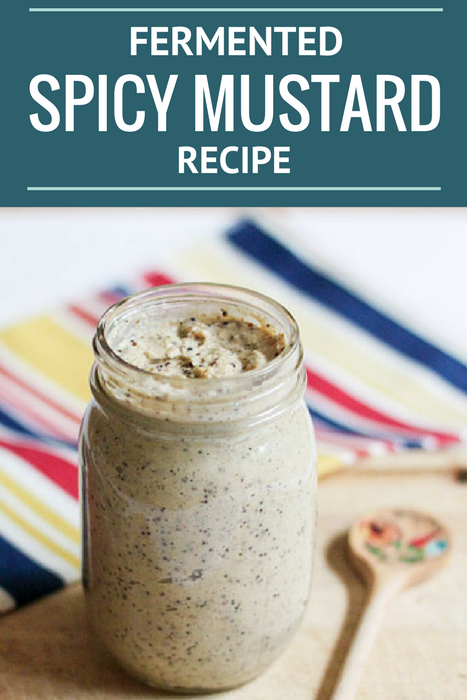 Allow the mustard to ferment on the counter (out of direct sunlight) for 3-4 days. After four days, move to the refrigerator and use within six months. You may notice some separation as time goes on which is nothing to worry about. Simply stir it before using. I’ll leave you with a final warning that this mustard packs a pretty big kick, definitely use in small doses until you know how much you can handle. This Spicy Fermented Mustard recipe is easy to follow utilizes real food ingredients. Hi! 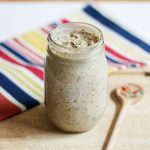 What type of liquid whey did you use for this recipe? I’m having a difficult time finding some and I want to make sure I buy the right product before attempting the recipe! Great question and happy to hear you are going to test out the mustard soon. We purchase plain organic whole milk yogurt (not greek) to begin with; there are different brands but your local grocery store should carry a couple options (32oz Stonyfield is good). Then we put all the yogurt in a piece of cheesecloth and tie it tightly so that it starts to press out the liquid (whey). We place the cheesecloth yogurt ball in a strainer and rest it over a bowl or dish to catch all the liquid. We usually let this process go overnight and by the following morning you have a bowl full of organic liquid whey! I hope that helps but feel free to let us know if you have any more questions. Good luck and enjoy the mustard! Have you ever tried using leftover brine from sauerkraut or pickles instead of or in conjunction with the whey? I think I may try it mixed. Hi Liane – We have used leftover brine from sauerkraut in many other ferments before (we love mixing some in with sourdough bread actually), but not our spicy mustard. However, that should work just fine and we will try it out in the future after reading your comment. We decided to use whey in this recipe as brine isn’t as readily available to people as whey can be, but there should not be any problems in our eyes. Good luck and let us know how it turns out! When you seal up the jar here – what about the air inside? I’m just thinking it looks creamy and not like brine to keep the ingredients submerged for fermenting. How do you seal this recipe so the fermenting happens nicely? With our mustard recipe, we don’t have a brine, rather we incorporate liquid whey into the mustard mixture and whip it together. Once the mixture has been blended we cap it tightly and let it sit at room temperature for a few days, we’ve found this helps with the flavor consistency after making different batches. After a few days it is good to go and we give it a stir before popping it into the fridge. However, we have never seen separation while it sits out, so stirring is not absolutely necessary. Adding the whey helps kick start the ferment by dropping the pH quickly, which we find helpful with this particular type of ferment. Thanks for the question – Cheers! Hi, I’m wondering why you would grind the mustard seeds first instead of fermenting them and then grinding, it seems like that would make for less work. Thanks! I retract my comment! 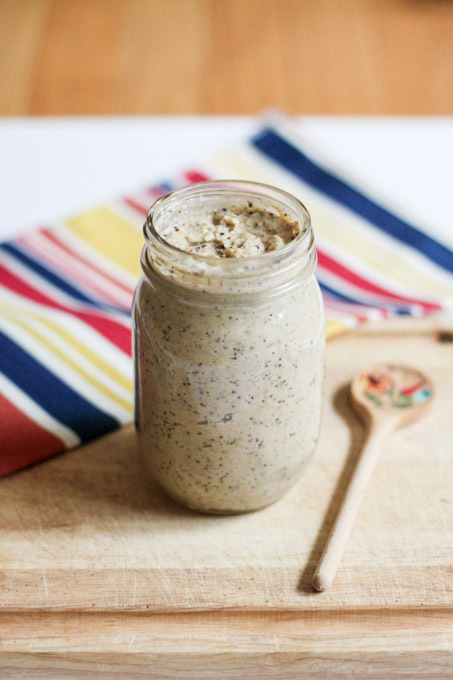 I’ve learned that mustard seeds are too antimicrobial and do not contain enough carbohydrate to ferment. As I understand it, it would actually be co-habitation, with the mustard flavoring the garlic and lemon juice which would be the doing the fermenting, if any were to occur. The probiotics you speak of would be coming from the whey itself, is that correct? I can definitely see that grinding the seeds on their own would be more effective in a food processor than with added liquid, but I would still be inclined to soak them first. Have you tried it that way? We haven’t tried to soak them for this recipe but know that is the preferred method. Let us know how it works for you.